I lagged a little getting this post to the site. Kill the Next One was published in December 2016 and was one of my favorite reads of last year. I thought I would wait until the paperback release to run the review, but there doesn't seem to be one on the horizon. Thus, you get the full-court press on the hardcover (or library) edition of this whackadoodle of a novel. 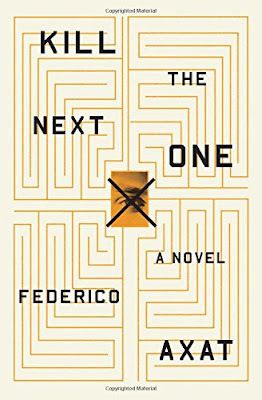 Argentinian author Federico Axat followed a complex recipe for his first work translated into English: create a compelling mystery, then wrap it in layers of uncertainty. Throw in some violence, a dash of a secret suicide club, a pinch of adultery, a mental hospital and enough repressed memories to ice the whole shebang. Don't forget the side order of demonic opossum. Write some scenes twice, changing them just a hair. Cut into pieces and mix, leaving your protagonist and readers to question their sanity for more than 400 riveting and agonizing pages. The result is a spectacular mind-meld of a psychological thriller, Kill the Next One. Poor Ted McKay is trying to commit suicide when he's interrupted by an insistent knock at the door. His visitor is a stranger who makes Ted an offer he can't refuse: kill a murderer who went free and a second man who is suicidal like Ted. In return for those two deaths, someone will kill Ted so he can die a heroic victim rather than by his own hand. As Ted tries to carry out his mission, the world tilts on its axis. It's unclear what is real, who is telling the truth and how Ted was chosen for his semi-nefarious deeds. As his mind fractures, memories start to leak through, bringing frightening clarity with them. Axat brilliantly creates an environment permeated by doubt and the anxiety it perpetuates. The story is chilling, but Axat has the skill to infuse it with humanity while maintaining the nightmarish atmosphere. Kill the Next One is a recipe baked to perfection. STREET SENSE: If you love a full plate of well-plotted mind-fuckery, do not hesitate. A FAVORITE PASSAGE: When you've decided to take your own life--it doesn't matter whether you have any doubts about your decision--those final minutes will test your will. COVER NERD SAYS: This one is a bit middle-of-the-road for me. It's not a turn-off, per se, but there's nothing about it that really attracts me other than its weirdness. I do like the font and the way the text is organized. The fact that it's odd certainly goes with the content. One reason I was looking forward to a paperback edition was to see if the would change the cover. Hopefully that day will come, particularly since I think it will open this book up to more readers, which it deserves.